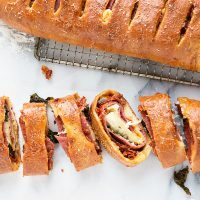 Italian style stromboli, filled with sundried tomato paste, Italian deli meats, mozzarella and Parmesan cheese and fresh basil leaves. In a large bowl or the bowl of a stand mixer fitted with the kneading hook, add yeast and sugar to bowl. Add water and let stand a few minutes. Add 2 cups of the flour, the salt and the olive oil. Mix to combine. Begin adding more flour, as needed, until you have a smooth, but still moist dough. Remove dough to a greased bowl. Cover and let rise until doubled, about 1 hour. Meanwhile, make the sundried tomato paste, by combining the sundried tomatoes, garlic and oil in a food processor. Blend until smooth. Set aside. Preheat oven to 425F. and prepare a baking sheet with parchment paper. Once dough has risen, remove to a floured work surface. Deflate slightly, then divide dough into 2 equal pieces. Roll one of the pieces of dough into a 8x12-inch rectangle. Spread dough with 1/2 of the sundried tomato paste. Top with about 1 1/2 - 2 overlapping layers of cold meats, then 1/2 of the mozzarella, 1/2 of the Parmesan, then top with a single layer of basil leaves. Starting with the long side, roll up the filled dough, pinching the seam and the ends together. Place onto a parchment-lined baking sheet. Repeat with the other piece of dough and place on the baking sheet, several inches away from the other one. With the palm of your hand, flatten the stromboli slightly. Brush lightly over each one with the beaten egg. Using a sharp knife, cut slits in the top of the stromboli, about 1 1/2-2 inches apart, but not cutting all the way across. Sprinkle with additional Parmesan and some freshly ground pepper, if you like. Allow to rise for 15 minutes, then place in the preheated 425F oven for 10 minutes. After 10 minutes, reduce the oven temperature to 400F and bake for a further 10 minutes or so, or until firm and golden. Allow to stand for 5 minutes before slicing/serving.